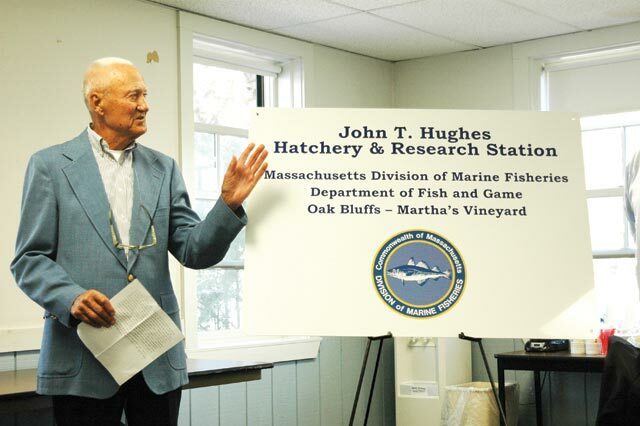 A ceremony held Friday afternoon to honor retired Division of Marine Fisheries (DMF) biologist John T. Hughes of Vineyard Haven had the flavor of a reunion. 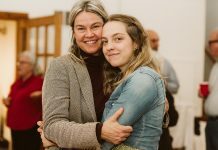 Many of the more than 40 people gathered in the meeting room of the Martha’s Vineyard Commission building had worked with the former director of the state lobster hatchery over the span of his long and distinguished career. In a brief formal ceremony also attended by family members and Island officials, Department of Fish and Game (DFG) Commissioner Mary Griffin and Division of Marine Fisheries (DMF) director Paul Diodati presented Mr. Hughes with the Dr. David L. Belding Award for his work in marine resource conservation. “Mr. Hughes’s work is critical to the scientific understanding of the life history of American lobster and greatly benefited long-term research and conservation of one of the most significant fisheries in Massachusetts,” Commissioner Griffin said. State officials also had a surprise for Mr. Hughes, who celebrated his 90th birthday on Friday. They announced they had renamed the former state lobster hatchery where he worked for 36 years in his honor. “Oh boy,” said Mr. Hughes, looking trim and fit. Mr. Diodati explained that the Belding award was a select honor that was most recently presented in 2007. Created in 1989, the award honors individuals who, in the opinion of the Marine Fisheries Advisory Commission, have done the most to promote the conservation and sustainable use of the Commonwealth’s marine resources. The award’s namesake, Dr. David L. Belding, was well known both to medical students and shellfish wardens in the first half of the 20th century, as he conducted two distinguished careers simultaneously — in medicine and marine biology. The award was funded in perpetuity by Dr. Belding’s family. When it was his turn to speak, Mr. Hughes spoke about his high regard for Dr. Belding, a man he respected and worked with early in his career. “The Dr. Belding award means more to me than all the tea in China,” he said as he accepted the award from Mr. Diodati. Mr. Hughes recounted his early days with the agency working with Dr. Belding on the growth rates of clams. At Dr. Belding’s request, he purchased four bottles of red nail polish, “Evening in Paris,” he recalled, for $5, a lot of money for a young biologist on a state salary in the early 1950s making $12 per day. The nail polish was used to paint clam shells, which have growth rings similar to trees. Mr. Hughes then regularly dug up the clams to check on the their growth rate based on the amount of new unpainted shell. Mr. Hughes began his career with DMF in 1948, according to a press release. A graduate from the University of Massachusetts and ex-Navy mine sweeper commander, he started his tenure with an assignment to work with lobsters at a state lobster hatchery planned for construction in Oak Bluffs in 1949. By 1951, the DMF lobster hatchery became operational, with Mr. Hughes as its first manager. He began lobster rearing experiments, gradually improving on techniques previously tried by others and studying the life cycle of this species. His annual production and release of lobster larvae and associated life history studies contributed to the knowledge of this species which also significantly benefited other researchers working on not only lobster biological but also human biological theses. Research specimens generated by the facility were sought after by the scientific community, and the facility served as a base for many visiting researchers, according to DMF. He retired from DMF in 1984. Over the years, fisheries managers concluded that the hatching and stocking of lobsters did little in terms of enhancing the natural population, and the program was stopped. In the nineties, the lobster mission was discontinued and the lobster hatchery became the Martha’s Vineyard Marine Research Station, although the old name continued to stick. It provided office space for biologist Mike Syslo, Mr. Hughes’s assistant, Greg Skomal, then a sport fisheries biologist assigned to the Vineyard, and occasional visiting researchers. Over the intervening years there was much talk about new funds and purposes for the building. Last July, local Island and state officials gathered for a brief ceremony to mark what many hope is a new era in the history of the long-dormant lobster hatchery overlooking Lagoon Pond in Oak Bluffs. With Mr. Hughes looking on, Mr. Diodati and Martha’s Vineyard Shellfish Group executive director Rick Karney signed a joint memorandum of agreement under which the state will refurbish and maintain the building and the shellfish group will utilize a portion of the space for shellfish propagation.